Hi all - two weekends ago five of us got together to make cards for 'Breast Cancer'. Instead of a 'Girl's Night In' we had a 'Girls DAY In' and made approx 150 cards. We had a wonderful day together and as you can see from the photos, we had a very productive day also. We are selling what we can to friends and family first then sending any left over down with the money raised. 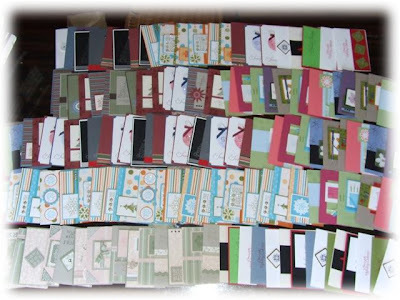 AND A VERY BIG THANK YOU TO STAMPIN' UP, for donating supplies for it. WOW - you busy busy girl!!! Bet you had a blast doing it though - and for such a great cause! Wow thats amazing. Well done. WOW that's great Debbie and it was all for such a great cause. Job well done Ladies!!! Three cheers for you all. Sounds like you all had a great 'Day In'! BIG CONGRATS on a wonderful achievement for a great cause, 150 cards, that's amazing!